Vancouver might not be known for icy streets, heavy snowfalls or frigid temperatures but that does not mean that winter is a breeze! If property owners try to take it easy, they can become buried quickly! In the right conditions, residential snow removal can be just as tough as clearing it away from a commercial property. Proper treatment and clearing of snow and ice creates inviting environments for homes, businesses, and multiunit properties. These specialists at Gorilla Property Services provide expert results and peace of mind to our clients. Proper removal equipment and expert techniques create safe and passable spaces for visitors and clients. The winter season on the west coast requires more maintenance than you might think. Hilly areas require constant ice control and snow clearing services than you might expect. Owning or managing a property is a full-time and often thankless job. Snow removal is more than just another daily chore, but it is a safety concern as well. While snow shovelling might be the most common method to clearing walkways, it is not always the most effective. In addition to curb appeal, clear pathways are a part of many city by-laws. Failure to remove snow and keep ice at bay can result in fines, as well as health hazards. A local, professional maintenance firm can eliminate these issues with both schedules and reactionary services. 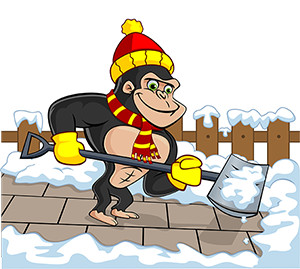 Certain property types require a bit more service than others, but the good news is that our Gorillas can create a snow removal schedule that fits your property and its unique needs. You can’t expect to use the same methods that you would use for homes to work on commercial snow, salting and winter emergency call outs, no property is left behind. One of the keys to successful winter maintenance is to understand unique property needs. Commercial spaces, for example, are usually much larger than those within the strata living spaces. Grabbing a shovel and clearing away a sidewalk is one thing, but tackling areas as large as a parking lot requires snow plowing. When you contact a Gorilla for your winter service needs, you are gaining access to both manual methods and machine treatment options. By utilizing a bit of muscle for those difficult to treat spaces and ploughs or snowblowers for the more opened areas, there is nowhere for snow to hide out or build up. While snow is the most obvious obstacle to enjoying winter, ice is not far behind! Improper ice removal can lead to slips, trips and tumbles all over the Vancouver area. The most common problem areas for ice occur against properties or uneven surfaces. As weather fluctuates, snow melts during the day and solidifies again when temperatures drop below the freezing point. These problem areas require their own custom ice management programs. A handful of rock salt is not enough to keep visitors on their feet, so ask the pros for the best methods for you. Snow might be the most obvious issue facing property owners, but ice is a real danger to both tenants and visitors. Ice can be quite visible at times, or it can come in thin black patches. Everyone knows that ice can be dissolved with salt, or at least made manageable through a bit of traction. How to get the best results on the other hand, is a bit of a grey area. Throwing down salt or sand and hoping for the best is not enough to maintain a passable outdoor space. By calling a professional for your de-icing, experts are able to identify problem areas for melt and moisture collection. By monitoring weather patterns, our Gorillas are able to create a treatment plan to accommodate incoming storms and changing temperatures.